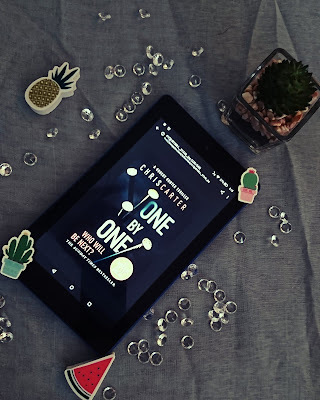 One By One is the fifth book in the Robert Hunter series by Chris Carter. The LAPD Robbery Homicide Division (RHD) deal with some of the sickest and worst criminals and serial killers imaginable. Robert Hunter and Carlos Garcia head up the RHD and are in charge of catching these sick minds. When Robert receives a phone call instructing him to go to a website there is nothing he can do but comply. When the website shows a man about to be killed and Robert has to choose between two death methods, what can he do? Before they have a chance to do anything another victim and another website is live but this time the whole world gets to vote how they die. Throwing everything into tracking this killer can Hunter and Garcia catch the killer before its too late. Before too many victims are voted for. Reading these books makes me wonder about the places Carters mind must go in his mind to write these amazing yet horrifying stories. Carter is a psychologist which I believe shows in his books, the way he writes about his killers and his characters. Yet again Hunter and Garcia are pushed to their limits and we see them evolve as characters even more. We as readers are pulled into the story desperate to turn the page and read on, not wanting to put the book down. We feel like we know these characters like they are apart of our world and we are apart of theirs. This is down to the fantastic writing and the wonderful imagery created throughout the book. Yet again another amazing book by Chris Carter, it had me completely hooked from the start right to the end, I just couldn't put it down. When I finished it, I felt like a piece of me was missing. So for these reasons I have chosen to give this book Five out of Five Stars.